Discover how to grow your subscription business from the explosive growth of the subscription box industry. Subscription boxes have become the single fastest segment of the subscription industry over the last 12 months, as have the number of offerings. What leads to fast growth within subscription boxes can help you grow your own subscription economy business. 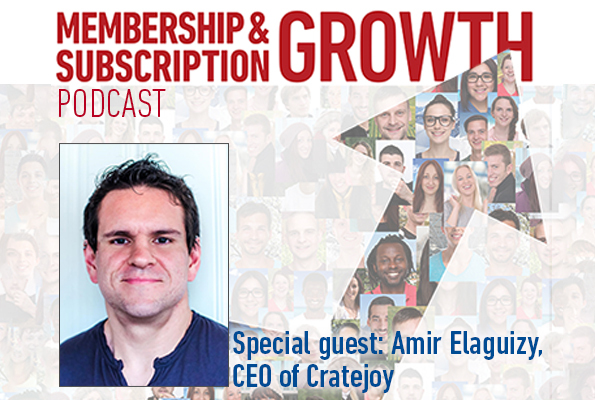 At the center of the subscription box industry is my recent guest on Membership and Subscription Growth podcast, Amir Elaguizy, the co-founder and CEO of Cratejoy. More than 4000 subscription boxes rely on the Cratejoy platform for marketing and fulfillment. Amir has seen what works within the subscription box industry and what leads some subscription companies to fail. Membership retention comes down to subscription fundamentals, understanding what your customer wants, delivering tangible value and delivering a terrific unboxing experience. A keen focus on quality and value – These are the things that the best of the best in the subscription box industry do. If you’re finding it hard to prioritize your to-do list, at least place these two things at the top. Amir Elaguizy is the co-founder and CEO of Cratejoy. Prior to starting Cratejoy, Amir was the co-founder and CTO of a poker software company, Market Zero, which was acquired by Zynga in 2011. Cratejoy provides everything you need to run, promote and scale your subscription box business. They provide a platform for sales, marketing, and fulfillment. To find out more, go to Cratejoy.com and start a trial on their platform. You could also email them at sales@cratejoy.com. They will discuss your individual needs and show you what a partnership with them can do for you. In addition, visit their free website, www.subscriptionschool.com, where they offer data, interviews, and helpful content for this industry.